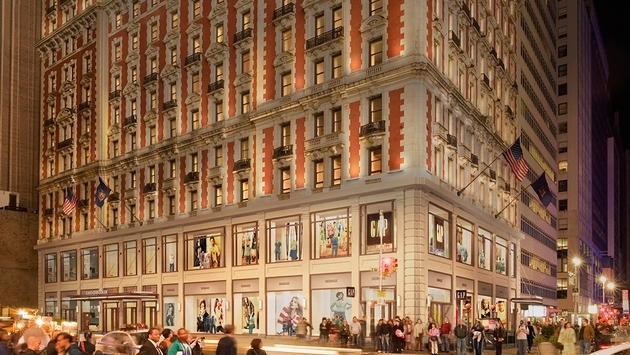 PHOTO: The Knickerbocker, set just off New York City’s Times Square, will debut next year as a luxury property. Every year in December the International Luxury Travel Market (ILTM) takes place in Cannes, France. This year was no exception as the 12th annual ILTM, held Dec. 2-5, brought together the top luxury suppliers and buyers in the business for one of the best luxury travel shows in the business today. Of course, ILTM is mostly luxury hotel and resort show, though there are a few cruise lines, tour operators and other luxury suppliers in attendance as well. All three levels of the Palais des Festivals, located on the famed Croisette next to beach in Cannes, were full of exhibitors representing nearly every luxury hotel brand in the world. Indeed, the event has grown nearly every year to the point where I doubt it can get much bigger. There were 1,450 buyers from 73 countries, including several hundred U.S. travel agents from such groups as American Express, Ensemble Travel Group, Signature Travel Network, Travel Leaders and Virtuoso. There were also 1,460 exhibitors from 96 countries, which is an increase of 4.5 percent compared with the show last year. More than 57,000 appointments took place during the short week, an increase of 11.7 percent. Now those are the hard numbers, but ILTM also exists to showcase the incredible variety of luxury experiences that buyers (namely travel agents) can create by booking these amazing high-end properties and other luxury products. This year ILTM also showcased a number of the most innovative or new hotels, highlighted for the unique experiences they deliver or expect to deliver when they open in the near future. The Brando: This French Polynesia luxury resort, nine years in the making, will open in June on Tetiaroa, the late actor Marlon Brando's private atoll composed of a dozen small islands surround a lagoon. Brando, who first visited the island when he was making "Mutiny on the Bounty," had wanted to develop an eco-friendly resort, but plans were delayed by his death. Now the property will finally make its debut in June with 35 large villas. Tetiaroa is located just 30 miles north of Tahiti itself, so guests will be ferried to the atoll by the resort's private two-aircraft airline. Cromlix House: Close to Dunblane, Scotland, this luxury boutique hotel is notable because it's the first lodging venture being developed by Scottish tennis superstar Andy Murray, the reigning Wimbledon champion. He plans to transform this Victorian mansion into a 15-room, five-star property. The hotel, located in Perthshire, will open this coming spring, right before the 2014 Ryder Cup, which will take place at Gleneagles, yet another high-end resort just a few miles away. The Knickerbocker: Sometimes you have to go all the way to France to find out what's happening back home. The Knickerbocker, located right off New York City's Times Square, was originally opened in 1906 in a Beaux Arts building. Now the refurbished property, set to open in 2014, is being reintroduced to the market as a 330-room five-star hotel, including 40 suites. It will include a fitness center (not the norm for most New York hotels), event space for up to 250 guests, a ground-level boulangerie, signature restaurant and bar, and a 7,500-square-foot rooftop bar and terrace overlooking Times Square. Too bad the property isn’t ready this New Year's Eve! Park Hotel Vitznau: This high-end property, located directly on Lake Lucerne in Switzerland, is a combination spa, wellness and rehabilitation resort. Housed in a historic building, the hotel, which has just 47 suites, has been completely renovated to feature modern design interiors and state of the art technology. Not surprisingly it has a very large spa and other wellness facilities. It also features two fine dining restaurants and a very large wine cellar (35,000 bottles). For me, however, the clincher was the views of Lake Lucerne the lake steamers, complete with large Swiss flags, cruising in front of the hotel. The Thief: Yes, it's rather an odd name for a hotel, but this Oslo, Norway hotel takes its name from Tjuvholmen, the city district once home to criminals and riffraff (there were criminals in Oslo?). The 118-room hotel, located on a small island within Oslo, is full of contemporary art and designer furniture by famed interior designer Wille Vage and Mellbye Arkitekter designed the entire building. With that kind of Scandinavian heritage, however, I wasn't too surprised by this property’s strong focus on design and art. It seems to ideal retreat for those seeking some quiet even in the middle of Norway’s capital city. The Ultimate Traveling Camp: I did a video interview back at ILTM Americas in Mexico with Maggie Nixon, director of sales for the Ultimate Traveling Camp, but I still find this mobile luxury camp one of the most fascinating lodging products around. Maggie was once again at ILTM Cannes to promote her product. Ultimate Traveling Camp provides guests with an up-close experience in the national parks, mountains, deserts and jungles of India, while providing all the modern creature comforts and more. Each tent has antique colonial furniture, en suite bathrooms and hot showers. Not surprisingly, the product features gourmet cuisine as well. If this is roughing it, count me in!